Solid, uncomplicated and undeniably satisfying. If that is what you are longing for in a tasty go-to meal that everyone in the family loves, then you have landed in the right place – campfire optional. To accomplish this, you’ll want to use your trusty Dutch oven, the one that braises the best beef roast and expertly cooks your Moroccan-style chicken tagine. If you don’t already own a Dutch oven, go out and get one, for they truly are all-purpose pieces of cookware that will last for many delicious meals, and years, to come. They bake and braise to perfection as their tight-fitting lids combined with solid metal or ceramic construction provides constant, radiant heat to the ingredients slowly simmering inside. Design features set aside, Dutch ovens are ideal for cooking bountiful stews and whole-chicken roasts, and if you’ve never conjured up a tempting dinner of Dutch oven peach and maple chicken thighs, then we suspect that you are missing out on what a simple pot can do for you. Get inspired by all the Paleo Dutch oven recipes out there, dream about Paleo campfire recipes, then slowly bringing your mind back to reality. 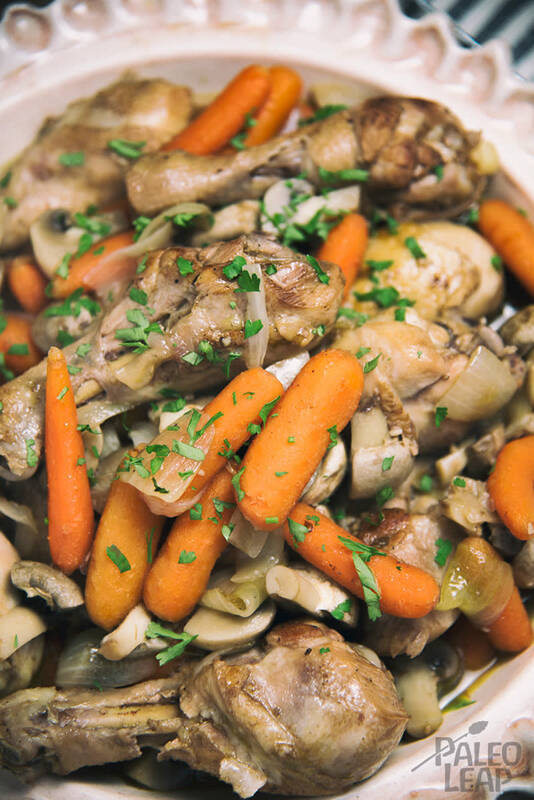 Chicken and mushrooms are a classic combination, though you can pretty much add any vegetables that you have on hand, this is a very forgiving dish. When squash is abundant and in season, toss that in, a sweet potato or two adds an element of creaminess to the dish. Gently place all your lovely ingredients inside your own pot and get baking. Melt the ghee in a large dutch oven on the stove over medium-high heat and brown the chicken legs on all sides for 1 to 2 minutes per side. Remove and set aside. Add the onion and garlic, cook for 2 to 3 minutes, then add the carrots, mushrooms and thyme. Cook for another 4 to 5 minutes, stirring occasionally. Deglaze the dutch oven with the chicken stock, then add the chicken drumsticks back in. Cover and place in the oven for 25 to 30 minutes, or until the chicken is cooked through.